BEARDOC SABATO 17 NOVEMBRE PRESENTA : PELOTEKA 2 ..
LA NOTTE PIU’ PELOSA D’ITALIA, IN CONSOLLE IL DJ SET DI ALEX O’NEILL & SILVER DJ ANIMAZIONE DEI BEARDOC BOYS : STEFANO ,LORENZO CHECCO… AND MUCH MORE! CONVENZIONE VALIDA CON STARSHOTEL VESPUCCI A CAMPI BISENZIO. BEARDOC LA NOTTE BEA PIU’ AMATA D’ITALIA RITORNA AL FABRIK CLAENZANO FIRENZE! ANIMAZIONE DEI NOSTRI BEARDOC BOYS. CONVENZIONE SEMPRE VALIDA CON HOTEL BIRI A PADOVA! 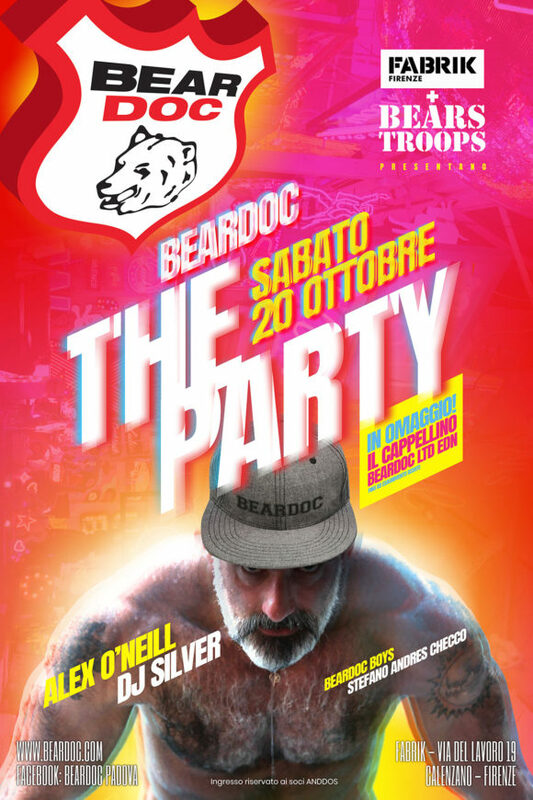 SABATO 20 OTTOBRE 2K18 RITORNA AL FABRIK DI FIRENZE ” BEARDOC THE PARTY” IN COLLABORAZIONE CON BEARS TROOPS. DOPO IL SUCCESSO DELLA PRIMA EDIZIONE RITRONA LA NOTTE BEAR PIU’ AMATA D’ITALIA PER FARVI BALLRE CON IL DJ SET DI ALEX O’NEILL E SILVER DJ. I NOSTRI BEARDO BOYS STEFANO, ANDRES, CHECCO ED UNO SPECIALE REGALO IN LIMITED EDITION CREATO PER QUESTO EVENTO!!! IL CAPPELLINO MARCHIATO BEARDOC PER L’AUTUNNO /INVERNO IN REGALO A TUTTI I PRESENTI SINO AD EASURIMENTO!!! BEARDOC INIZIO DI UNA NUOVA STAGIONE. SABATO 6 OTTOBRE PRESENTA ” FUEGO” LA NOTTE CHE DARA’ INIZIO ALLA BEARNIGHT PIU’ AMATA D’ITALIA. ANIMAZIONE DI NOSTRI BEARDOC BOYS E MOLTE ALTRE SORPRESE. BEARDCO E’ AL FLEXO IN VIA TURAZZA 19-PADOVA.CONVENZIONE SEMPRE VALIDA CON HOTEL BIRI PADOVA! SABATO 1 SETTEMBRE AL PADOVA PRIDE VILLAGE QUARTIERE FIERISTICO DI PADOVA IN VIA NICOLO’ TOMMASEO 19. SUPEROSPITE DAL VIVO NATHALIE LA VOCE DIE SOUNDLOVERS CON TUTTI I SUOI SUCCESSU .HOTEL DI RIFERIMENTO NH MANTEGNA A LATO DEL PPV. PRIMA DELLA SERATA APERITIVO AL CHIOSCO DLE BABUSKA NEI NAVIGLI VIA COLOMBO – PADOVA ZONA PORTELLO. RITORNA IL PIU’ GRANDE EVENTO BEAR D’ITALIA AL PADOVA PRIDE VILLGE IN VIA NICOLO’ TOMMASEO 19 A PADOVA! SUL PALCOSCENICO DEL PADIGLIONE SPETTACOLI I NOSTRI DJ ALEX O’NELL SILVER DJ E ANDY J PER BALLARE TUTTA LA NOTTE. ANIMAZIONE DI TUTTI I NOSTRI BEARDOC BOYS E MOLTE ALTRE SORPRESE! ZONA PORTELLO DI FRONTE SEMPRE ALLA FIERA! VENERDI 22 GIUGNO 2K18 …GLI ORSI TORNANO A BOLOGNA!!!! VENERDI 22 GIUGNO 2K18 ..GLI ORSI TORNANO A BOLOGNA!!!! PER LA PRIMA VOLTA BEARDOC PRESENTA ” THE PARTY ” AL CASSERO-BOLOGNA A PARTIRE DALLE ORE 22.30 . PER L’EVENTO L’INGRESSO SARA’ COMPLETAMENTE GRATUITO PER TUTTA LA NOTTE E SENZA BISOGNO DI ESIBIRE NESSUNA TESSERA! 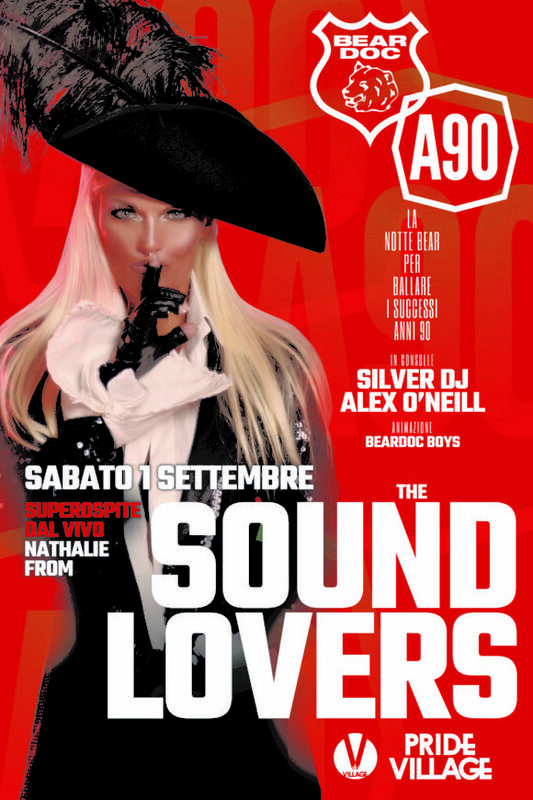 NELLA CONSOLLE DEL CASSERO I NOSTRI DJ’S : SILVER DJ ED ALEX O’NEILL ANIMAZIONE DEI NSOTRI BEARDOC BOYS CAPEGGIATI DA STEFANO!! PER CHI VUOLEDALLE ORE 18 FAREMO UN APERITIVO PRESSO IL BAR ” RUZZ ” IN VIA SANTA CROCE 16/E -BOLOGNA A DICI MINUTI A PIEDI DAL CASSERO!! BEARDOC THE PARTY AL CASSERO A BOLOGNA… PASSAPAROLA.. WOOOOF!!!! 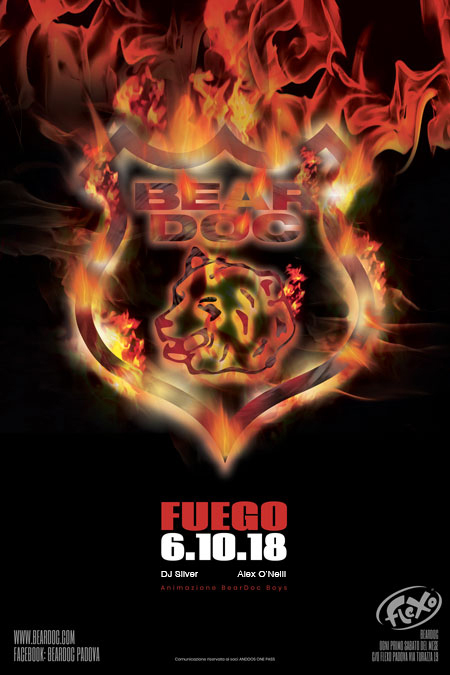 SABATO 2 GIUGNO BEARDOC PRESENTA ” THE FINAL COUNTDOWN ” L’ULTIMA NOTTE PRIMA DELLA PAUSA ESTIVA NELLA LOCATION DEL FLEXO. 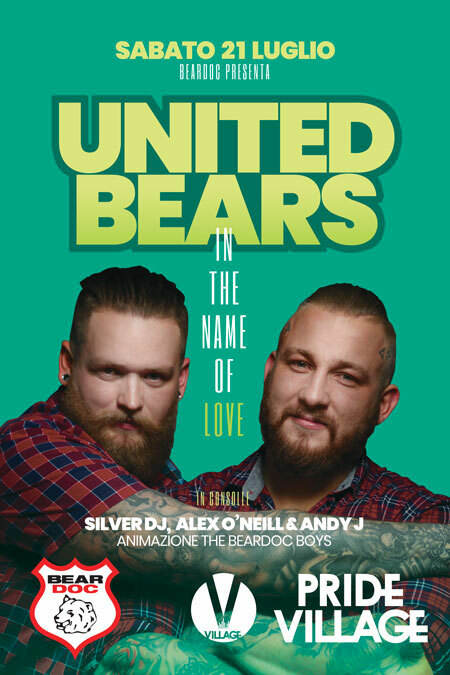 IN CONSOLLE ALEX O’NEILL E SILVER DJ ANIMAZIONE DI NOSTRI BEARDOC BOYS ED UN SPECIAL GUEST NEL NOSTRO GIARDINO I SUONI VYNIL ANNI 90 CON DJ MARCO RIVIERA. CONVENZIONE SEMPRE VALIDA CON HOTEL BIRI E B&B MEDOACVUS. L’APPUNTAMENTO AL FLEXO SARA’ PER IL 6 OTTOBRE..
MA LA CALDA ESTATE DI BEARDOC NON SI FERMA.. TANTE SORPRESE E NOVITA’ IN ARRIVO… SAVE THE DATE!!! PROTAGONISTA IL DJ SET DEI NOSTRI ALEX O’NEILL & ANDY J . DANCING IN THE DARK LAMIE ACTION DJ .